Gonzaga University appears in our ranking of the 30 Best Online Schools for Graduate Degrees. Gonzaga University offers degree programs designed for all types of students, including traditional students and those who want to take online classes. Undergrads can earn one of 15 degrees and choose a major from more than 50 fields. The university also offers nearly 40 minors for those students too. There are now 23 programs for graduate students and five options for doctoral students also. The programs for undergrads range from majors in accounting to writing. Students in the writing program learn how to express their thoughts and ideas through the written word. Not only do they submit their work and talk about it in class, but they also critique the work done by their peers. The university’s accounting program prepares students for earning a graduate degree and taking a professional licensing exam. There are several different education programs available that help students get their teaching licenses in Washington too. Other popular majors for undergrads at Gonzaga University include solidarity and social justice, kinesiology and exercise science, computer science, biochemistry, and psychology. A Doctor of Nursing Practice is available for students who have a bachelor’s degree. This program allows them to make the transition from the field to the classroom and back again. They’ll take graduate-level courses as they work their way towards a doctoral degree. A Doctor of Philosophy in Leadership Studies is another popular option for doctoral students. They can develop strong leadership skills as they learn how to put their skills into practice. The university offers both nursing and education doctoral programs too. 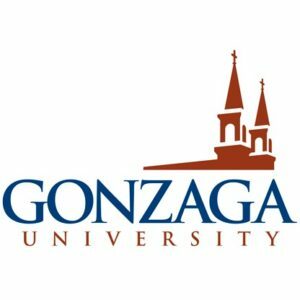 Gonzaga University offers seven online graduate programs that give students a convenient way to study and complete their work. Some of these programs require that students do fieldwork or internships in the field in addition to completing classroom work. They can earn a graduate degree in leadership studies, nursing, sport and athletic administration, and other areas of leadership. Gonzaga offers traditional graduate programs, including a school psychology program and a clinical mental health counseling program. Gonzaga University is a private university that has an affiliation with the Roman Catholic Church and the Society of Jesuits. The Society of Jesuits established Gonzaga College in Spokane, Washington in 1887. It kept this name until 1912, which is when the college became a full university. U.S. News and World Report ranks it as the fourth best college in the western United States and included it on a list of the best schools for engineering majors. The publication also ranked the university as being more selective than other in terms of who it admits and its admission requirements. While Forbes ranked Gonzaga as the 141st best American university, Washington Monthly ranked it as the nation’s 14th best graduate school. The Princeton Review also considers Gonzaga one of the best American colleges. It offers many study abroad opportunities, including programs that allow students to travel with their professors or peers and on their own. Gonzaga University maintains a small class size and has an enrollment of around 7,500 students. Not only does Gonzaga have the regional accreditation that lets students transfer their credits, but it also has accreditation for many of its degree programs, including those in music and nursing. The NWCCU provided the university with the regional accreditation that allows students to seek financial aid opportunities from the government. Some of the other accreditation that Gonzaga has comes from the American Bar Association (ABA), Commission on Collegiate Nursing Education (CCNE), National Association of Schools of Music (NASM) and National Council for Accreditation of Teacher Education (NCATE). Though Gonzaga accepts more than 70% of the undergrads who apply every year, it only accepts those who follow its application steps and meet all its academic requirements. It has an early action deadline of November 15 and a priority deadline of February 1 for those who need financial aid. The university typically sends out decision letters within a month of either deadline. Students must have a minimum score of either 23 on the ACT or 1150 on the SAT and have a grade point average of 3.2 in high school. It also looks for those who completed a competitive college prep curriculum. Students can send their transcripts and test scores through the mail or submit digital records and complete the online application. Graduate students will find one application designed for those applying to the university’s law school and a second for all other programs. They can create an account and fill out sections devoted to their collegiate backgrounds and other information. The university provides detailed instructions on completing the application too. Most programs ask for official transcripts and test scores, but some programs may ask for more information too. Students may find that they need to submit letters of recommendation, a copy of their resume, contact information for their references and/or writing samples. Though Gonzaga is a private university and charges a higher rate than public colleges do, it offers financial aid packages that make attending the university more affordable. Undergrads pay more than $62,000 a year, which includes a full-time tuition rate of $44,280 per year. Room and board add more than $12,000 to that total, but students can choose from different room types and meal plans to lower their costs. Graduate students pay at least $700 per credit hour, and some programs charge more than $1,000 per credit hour too. Gonzaga has a tuition calculator available for those who want to see their costs ahead of time. The easiest way for students to get financial aid to attend Gonzaga is with the FAFSA. This determines which types of federal and state aid they will get based on how much support they need. Only those who submit the FAFSA can take out federal loans and use different grant programs. The university has special awards and offers employment opportunities on its campus too. Many students will want to apply for scholarships also. There are 14 scholarships for incoming freshmen that provide students with at least $1,000 a year and several scholarships for transfer students. Gonzaga University promises that any student enrolled in one of its degree programs will continue receiving financial aid if they make satisfactory progress towards a degree.